Warning: a “First Flight” is an ongoing log of my impressions and experiences during my first and VERY first launch of a new app. You are reading exactly what I’m thinking when I’m thinking it, during my first ten or twenty minutes of hands-on experience with the thing. I do think it’s valuable to document these things. True, true: you can’t possibly reach any conclusions about the nature of an app in the first fifteen minutes. But the joys and frustrations you experience right off the bat can be illustrative. So: DO NOT refer to this as a review; DO NOT lambaste me for judging an app based on a quick launch; DO NOT point out that if I’d bothered to check the Help menu I’d have discovered that I could have fixed everything with a Command-Option-Shift-G.
Because the proper response to such a complaint can only me my pinching your nose tightly between my index and ring fingers and then slapping my other fist down my forearm so hard that the sound effects guy dubs an old-timey car horn sound onto the soundtrack. Time to play with OmniGroup’s new OmniFocus task-management app. I’ve seen this in beta and was v.impressed with its approach and its goals. And I use OmniOutliner to run a fairish percentage of my life, so my expectations are high. Macworld Expo also gave me the chance to get a 45-minute personal runthrough from the app’s designer, who was nice enough to work through all of my questions. I was certainly left thinking that this is could be a terrific product. I’ve never used a personal organizer or a project manager; they all seem to want me to run my life the way that programmers run theirs. To this I respond: have you seen the way most programmers run their lives? Case closed. The other problem is that acolytes of the “Getting Things Done” model of organization have been becoming increasingly PeTA-ish in how obsessively and annoyingly they pursue their Missions. Dine out with a GTD’er and you’ll have to walk to his side of the table and get your own damned salt. Because if you ask him to pass it to you, he’ll be lost in thought as he tries to work out how to contextualize that into an actionable result. So that was my main worry as I read the product page; “GTD” is indeed spotted here and there. But they don’t seem to be all “blow up a research lab in the interests of protecting living things”-ish about it, so it’s all good. Launches with some helpful action items already in there. “Getting Started With OmniFocus” and (uh-oh) “Learn More about Getting Things Done” are my existing projects, evidently. Merlin Mann gets a free bookmark? Why isn’t OmniGroup sending free traffic my way? Sure, I have nothing to do with this product or its goals, but still. A summons for jury duty arrived while I was away. I need to fill out the little card and mail it in. Tap command-N to create a new action item…it creates a new window, not a new item or a new project. Bad call. Am I going to spend more time in this app creating windows, or creating to-dos and goals? Exactly. Ugh, it isn’t even command-SHIFT-N…that’s for creating new projects. It’s command-CONTROL. This is going to be a hassle. I remember from the demo that there are many ways to add actions; hopefully there’s something better in there. Okay: command-CONTROL-N. Wait…that creates a new item in “Learn About Getting Things Done.” Well, that makes sense; I had that item open. Err…okay, how about I drag it into the Inbox? Yup, that worked. Hmm. I wish this window had column headers. I can get by context that the first field is the description, the next are Project and Context and other icons. But glancing to the top of the window and seeing it explicitly spelled out is reassuring. “Mail in card for jury duty.” Tab. Er…is this really a project? Here’s where I usually fail at these apps. I like OmniOutliner because I can just build lists and check them off, free-form. But I appreciate that an app like OmniFocus can help me handle things that are much more complex. Still, I’d love to have one single “dashboard” for everything I’d like to do, large and small. Let’s make this project “Snail Mail.” Type. Enter. It disappears. Okay, I know this is a bit of a ringer. As I type, a little cue drops down from the field: “New Project: Command-Return.” No mistaking that. Still, I wish I knew why the keys that seem to work in every other app aren’t the ones I can use here. The Omni guys build great stuff and there’s prolly a reason. One that makes sense to them, anyway. Now there’s a field for “Context.” Deep breath. This is the heavy-voodoo bit of this. I admit that “context” just makes no readily-apparent sense. You really do need someone to explain a philosophy behind it. Off the top of your head, what’s the “context” of mailing a jury-duty form? Is it a piece of mail? Is it something you do because you don’t want to get arrested? Context? I suppose I’ll be sitting at my kitchen table while I do this. Should I write “Just after lunchtime, when I’m not quite ready to go back to work and am looking for an excuse to get out of the house? I think about it for a few moments. “Post Office,” I guess. “Mailbox” seems stupid and pedantic, as does “stamps.” I’m trying to think of this as something that would be useful to me later. If “Post Office” is the context, then it can also be applied to things like buying stamps, picking up mail on hold, paying the annual rent on my PO box, that sort of stuff. Hey, maybe Snail Mail is indeed a good Project. Just remembered that I need to mail off two copies of my new book to some contest winners. Hmm…nothing happened. The title of “Inbox” highlighted but that’s it. Wait…Control-Shift-N is now simply selecting Actions every time I hit it? Ohhh…according to the File menu, it’s Control-Command-N. My fault. But dammit, these things happen when you make me learn a new command instead of allowing to use the old command that seems like the best, most obvious choice. (Sigh.) Nope, still does nothing. Wait, now it does. Did I screw it up again, or is it context-sensitive? I bet I screwed it up. But (hate to keep harping on this, but I must) if it were Command-N as it should have been, I wouldn’t keep messing up. Cool. Auto-complete on both Project and Context. Still feels a little weird to refer to post-office stuff as a Project. Seems a bit like referring to American Pie 5 as Cinema. Need to finish up a list of products I’ll be including in a Consumers Digest feature. That one has a deadline…and it’s a very natural project-ish sort of thing. Open Inspector, add “today” as due date. Item immediately turns red. Crap, I’ve only been using this app for ten minutes and already deadlines are turning red on me. I also feel weird tapping in “Midnight” when (again) the actual time doesn’t really matter. Let’s try something with Attachments, which impressed me in last week’s briefing. I’m planning on a blog post about the ModBook and Paul Lee, a comic artist I met at the booth. “ModBook blog post”; Project: okay, “CWOB”; Context? Umm…”Blog,” I guess. Can’t blog without the blog though I can’t help but think I’m making an error by choosing a Project and a Context that are damned near identical. Again confusion about Contexts. “Where” is this action item? “What” do I need to do it? It could be almost anything, which in one sense gives me a lot of power to organize my world as I see fit, but in another sense gives me a slight blip of confusion every time I create something. Worst-case is that I simply leave this blank for most things. Writing this blog post will involve pasting up a bunch of questions that Paul answered via email, and some digital art that he’ll be sending me when he has a chance. Click on the “Attachments” icon, drag in a drawing he sent me over the weekend. Cool; shows up right under the action, indented slightly. Wish it were a thumbnail instead of a generic JPG icon. But good news: it supports QuickLook so I can check it out without opening it in Preview. Cool. Drag in an email message. It appears as a link to the original message in Mail (good) but it appears on the same line as the JPEG icon (not good). Drag in the remaining two…same deal. If I want each one on a different line, I have to insert the line breaks myself. Seems like “put each attachment on a new line” (or some other thing that makes it easy to separate multiple attachments) would make sense. Another situation where I wish I could deadline this as “This week, sometime.” Instead I lie and say that it has an actual deadline of midnight on Friday. Inspector: Repeat Every (1) Days. Bang. Good. From my briefing last week I know that OmniFocus will create a brand-new Action with this information every single day. I should also create one for my Sun-Times deadline; he explained that every repeating action is in fact its own thing, which means that I can add individual details for each specific column. Dangit, I need to select “Inbox.” I accidentally created it as an item in the project that was already open. I don’t know if I like that; instinctively I think “create a new action” should but a push-and-go thing; I shouldn’t have to think about where I am in the app, or navigate to a different place. “Mac,” I guess. Sigh. It’ll take me a while to get used to this. I don’t know if I can rightly blame OmniFocus, though. I’ve never used this style of app before. Now I’m confused. Look at all those…things. I think I remember some of those from the demo. I’m starting to wonder if I’m not being presented with way too many options here. Okay, so this “every week” thing isn’t limited to just actions; it can also be a whole project. So it might make sense to make “Write a Sun-Times column” a weekly project, with a batch of action items for each column (“Talk to Steve about where he got the idea for MacBook Air”, “Doctor up some phony pictures of the ‘Mac Air Nano'”…that sort of thing). But would I really want that application sidebar to contain fifty-two Sun-Times projects every year? No, what happens is that it disappears when completed. So only columns-in-progress would be there. Okay…but when I add a new Action, would it be more complicated to figure out which week’s column it should apply to? Overthinking things, Andy. Let’s just make a recurring Project. That’s the one that’s “due” by the end of the week. Where’s the other idea I had? The one with no deadline? Click on “Snail Mail”…no actions. Click on “Inbox.” Okay, I have one item for “Finish Project Universe.” But why (the hell) didn’t it show up in a search? Why didn’t it show up when I clicked on the project title? UGH. Okay, here’s what happened: it’s not a global search. It only searches the one thing you’ve selected. Which has a two-pronged bad effect: it doesn’t immediately understand a “find every action that matches this” request unless you think to somehow select your whole universe first, and secondly, if you forget that the search box has the word “universe” in it, when you click on other projects they’ll all appear to be empty. Is that why I didn’t see any of my other actions? Nope. All projects are still empty. Again I ask: what the hell? …But there are still empty projects which I know contain actions. Do I have to manually drag actions out of the Inbox and into their related projects? I just assumed that defining a project when creating the Action would cause OmniFocus to do that sort of thing automatically. Dangit. It looked so bloody simple in the live demo. It looks like I’m just going to have to sit down with the manual and read it. I did understand it when someone with lots of experience was showing the app off. I suppose the analogy I’d use is someone trying to edit their home movies on Final Cut Pro. An experienced editor will, even if they’ve never used FCP before, at least recognise what a lot of the underlying concepts of the application are and recognise the names of a lot of the menu commands etc., while the home movie maker will probably be pretty lost and would be better with iMovie. 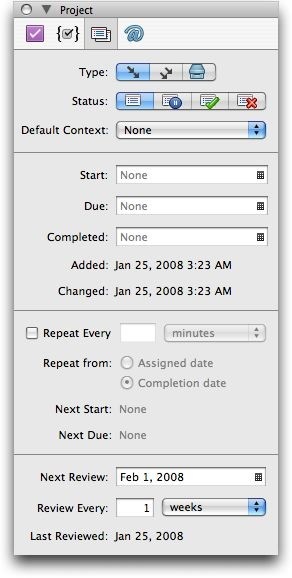 OF to me is like the FCP of task-management: I know Omni try to say OF doesn’t have to be used for GTD, but I really think you need to have read GTD (or at least understand the basic concepts of it, like what the GTD definition of a project and a context is) to get much out of OF. In particular, the project-context paradigm really only makes sense to me in the context of GTD. I think most non-GTD people are probably better off with a less complex task-management app, to be honest. Thanks for trying OmniFocus! It’s really helpful for us to see the frustrations you encountered in your first fifteen minutes, and we’ll spend some time thinking about it. Hopefully some of my comments will help reduce future frustration (especially about creating new actions! ), and if you have any suggestions about how we can make these things more intuitive I’d love to hear it. The reason we require Command-Return to create a new project or context is because we’re autocompleting against your existing project list (which you do by entering just a few letters from your project or context name), and when autocompleting we want creating a new project to be an explicit action. (For example, I enter “dof” to get to “Develop OmniFocus”, but if that project doesn’t currently exist I don’t want to accidentally create a new “dof” project instead. Or maybe I do want a new “dof” project even though it already matches “Develop OmniFocus”.) Of course, you can also create a new project or context by adding it to the sidebar directly, or (in the case of a project) by promoting an action to a project (by outdenting it like you would in OmniOutliner). But while that’s our reasoning, it doesn’t mean it’s not confusing at first. Maybe it would be less confusing if we didn’t let you tab out (and potentially lose whatever you’ve entered) while you have something in that field that doesn’t match an existing item? There are lots of shortcuts for entering dates: instead of opening the calendar popup, you can just enter “today” or “next week” or “+3w”. I don’t generally enter times, which means that the times default to midnight (so they become available or due at the beginning of the day). By the way, if you want “due today” to mean “due today at 5pm”, you can change the default due time to 5pm in preferences. My context for things like blog posts is “Internet”, since I can do it anytime I’m online. In general, I’ve broken down my Mac context with subcontexts like “Email”, “Internet”, and “Xcode” so that I can group similar types of activities to match my mental state rather than hopping around from one type of thing to another when I’m trying to do things. I like your idea of automatically inserting some newlines between items dragged onto an action. Finally, even though you’ve tentatively assigned a project and context to each of your inbox items, they remain in the inbox until you confirm you want to move them out into their projects by pressing the “Clean Up” button. We did this so stuff didn’t move out from underneath you while you were editing it, but I don’t think we’ve hit on quite the right answer yet; they should probably move automatically at some point (perhaps as soon as you select a different item in the sidebar?). Again, feedback is welcome! Thanks again for posting these first impressions, Andy! It’s incredible useful feedback for us. P.S. — Perhaps this is obvious once you understand that Return adds a new action, but perhaps not: you can add new actions directly to a project (rather than starting out with them in the inbox and then sorting them into projects) by selecting that project and pressing Pressing return to create a new action. Also, you don’t have to assign a project or context to things you place in the inbox; those fields are optional, so you can just leave stuff in the inbox and check them off directly from there. A lot of the power of OmniFocus does come from organizing things into projects and contexts, but that doesn’t mean that everything has to fit into the perfect pigeonhole before it can be done. If it takes you longer to decide where to put something than it would to just do it, you should feel free to just do it and check it off! I honestly had my doubts about OF to begin with, but now I’m pretty hooked. Honestly, it’s gotten me to switch from Thunderbird to Apple Mail because of 2 features. 1) You can send email with a specific subject heading, or to a user like mwyner+omnifocus, and it parses through that info, pulls out an action and maybe project/context/due date, and puts it in your OF inbox. 2) Clipping an entire message or part of a message is my favorite feature. My manager recently sent out emails about doing our focal review self-assessment. OF used the subject line as the todo item, and put the rest of the message in with that todo item as a note. All I had to do was assign a due date, and I was done. I’m not a die-hard GTD person, but I like the concept, and I’m “kind of” following it. Hey, for the first time in pretty much forever, I’ve been able to keep my work inbox completely empty for about a month now, and I’ve usually only lasted days when trying that in the past! @Ken – Ohhhh…okay, that’s very useful. I clicked “Clean Up” and all Inbox items were automatically sorted to their correct projects. It _was_ surprising that they didn’t go there automatically, but I now I understand the metaphor. It’s like Mail. Everything lands in my Inbox, sort as a “front door,” and I can organize these tasks into projects if I wish. For me (for ME) the ultimate ideal would be a tool that lets me just drop Tasks into a list with minimal fanfare or thought, but which can also let me impose order and structure and focus once that sort of organization seems to make sense. OF seems to have great potential towards that end. @Ken – So let me get your opinion: if my inclination is to only use “projects” for multi-step, multi-action sort of targets (all the things I need to do to get my taxes done) and to use “contexts” to simply tag related individual tasks that seem to be “done in one” sort of things (“Write a blog post about ‘One More Day'”, would that make sense? In fact, it’s starting to dawn on me that this is prolly the best way for me to use it. IE, something starts out life as an Inbox task and gets promoted to a project as it becomes more complicated. I have indeed spotted the different project classifications (“These are a series of steps that have to be done in sequence” “These are steps that can be performed in parallel” “these are more or less unrelated to each other”). I’m starting to think that part of the key to using OF is the ability to ignore things that you’re not really ready to use yet/things which just won’t help you understand your goals any better than if you kept things simple. @Ken – I AM still at a loss as to how I get a simple answer my most important question: “What are ALL of the things I need to get done today?” I seem to be able to get that by clicking on individual projects and the Inbox, but there ought to be one big fat button that pulls EVERYTHING from EVERYWHERE. I’ve been quite torn with OmniFocus. I think it has a strong set of capabilities, but as you’ve experienced, there’s a learning curve. I find the UI to be less than intuitive. It sort of reminds me of the BMW iDrive system–not real intuitive, too many ways to move that controller and a lot of functions with icons I don’t recognize. However, after spending a lot of time with it, and reading the manual, it begins to make sense. This may be harsh, but OF is more akin to Windows that to Mac as far as ease of use. I think my problem, however is being more visual–so I think all these apps may be suited for others, but not for me. I’ve been playing with many recently introduced mind-map apps for projects and time management. Then I add simple to-do lists, like Ta-Da list from 37signals (web based freebie). Crap, this comment has turned into a blog post! I must stop here. Thanks, Andy! So true. Also, the design is horrible! Great conversation here. I thought it was just me not getting the GTD system and stuff. It’s like I want to go back to Outlook. I think right now I am going to re-check the new Entourage in Office 2008 for Mac. Am I making a mistake? @RevTim – You owe your allegiance only to the app that works best for you. I like OF so far. I do think that they need to move past the “one window for all men and all seasons” UI and tailor different “faces” for different needs. NO, don’t give in to the man. Don’t read the manual! I love OmniFocus. I am very familiar with GTD, but there was still a learning curve with OF. I watched the QuickStart video several times during the first few weeks (I also participated in the Alpha releases). I find OF invaluable now for quickly getting thoughts into the inbox. I later organize them into projects and contexts as needed. I then plan my days and weeks from the context and project views. I haven’t played much with Perspectives yet, but they seem very helpful. I’m really looking forward to a possible iPhone version of OF to take a few of my contexts on the go! Andy – You’ve essentially hit on the definition of “project” – anything that takes two or more steps to accomplish. “Put Hammer in Drawer” isn’t a project. Yes, step one is to easily get stuff out of your head, which is what the Inbox is for. In that initial capture phase, you don’t have to worry about whether it has a project or context or is even actionable, your goal is simply to get it out of your head so you can stop worrying about it. Now that you’ve got some concrete actions written done and sorted them into contexts, you can flip over to Context Mode and see each of those actions grouped by context. You can do stuff in the contexts you’re already in, or notice that you need to shift contexts to do some other stuff (like go to Fry’s). By working out of your contexts (rather than your projects), when you’re going to Fry’s you can pick up your hard drive for a work project and an extension cord for home at the same time (even though they’re items from totally different projects) and save time wasted on shifting contexts. For easy access to perspectives, you can create your own (based on the built-in ones from the menu or not) and those can be added to your toolbar for one-click access. (You can also assign keyboard shortcuts to your perspectives, if you prefer one-key access.) Perspectives remember the current mode and filter settings, as well as which columns are visible (e.g. if you want to see your due dates in the outline) and what items are focused and/or selected. I sent the omni guys a note. I really really want this to work, but I’m in the same boat as you. I’m not giving up, but Remember The Milk online is kinda nice? 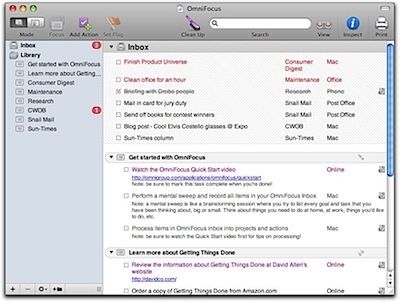 I tried and actually payed for omnifocus. I am a big fan of the company and own and use several of their programs. There is no doubt that there is some impressive programming here. However, Things by culturedcode software just works the way your brain does to get things done. You can be up to speed immediately. A lot of people say “just give omnifocus time”. I dont think you should have to retrain your mind to get things done. Having said that omnifocus will probably be all over the iphone sdk and I can only hope that culturedcode will do the same because Things definitely will need to be improved at that point. Currently Things is free (alpha). Anyone who just doesn’t immediately get omnifocus should try Things. (Of course watch the screencast first on the website) The will truly be amazed at the difference in ease of use and, therefore, true power. I am just a user of Things and do not have any connection with the developers. PROJECTS: I think of these as desired outcomes. ACTIONS: The smallest ‘do-able things’ that you can break a project down into. e.g. Hoover the floor, clean the cat hair off the cushions, brainstorm ideas for next blog post, review blog ideas and select one, prepare 6 photos for a web item, photograph item to sell on eBay, write speil for eBay, upload auction to ebay, buy packaging, send item. CONTEXTS: Where do I have to be, or what ‘mental mode’ do I have to be in to get an action done? e.g. I cannot hoover my office floor when I am at the Post Office – I can however buy packaging for my eBay items. If I am in photoshop preparing photos for a blog-post, I could also tidy up my eBay auction photos. No point trying to clean cat hair off the furniture when my head is in ‘Photoshop’ mode. Learning how to use Persepectives in OF is really key. I have a context for every shop I go to regularly, all within an ‘out of the house’ context. When I’m about to pick up my keys, I select my ‘out the house’ perspective and print. That way I get a list of every place I need to visit and a ticklist for what to do when I’m in there. One of the biggest things that the GTD book outlines, is that people often confuse projects and actions. ‘Achieve world peace’ is not an action, it is a project. It should not have a tick-box next to it, as there is not one single thing you can do to fill in that tick-box. It is a desired outcome. It is a bucket that holds (rather a lot of) discrete tick-able ‘things to do’. People who mistake projects for actions often look at their to do list and ‘don’t know where to start’. The GTD system also relies on a ‘weekly review’ in which you go through your entire ‘pile’ of actions and projects and put your house in order. This is really really necessary for the whole thing to work – otherwise the relief you feel by writing things down as soon as they come to you rather than keeping them in mind all day is not backed up by the knowledge that things won’t ‘fall through the cracks’. A ‘Someday Maybe’ projects folder is a good place to ‘park’ things that you want to have documented, but you don’t want to have to sort through every day when you’re working out what immediate fires need putting out. Sounds like “Things” might work better for you, Andy. It’s still not 1.x version yet and there are still features that are missing. But it is definitely simpler and more intuitive/easily understood than OmniFocus (which i am currently using to see if it works for me). I am really surprised that some people are having problems with OmniFocus (other than those trying to sell other products that is!) I think this shows that specific metaphors work for specific people. I have read GTD and whilst I’m not particularly a disciple or advocate of this approach in its entirety, when OF came along, I watched the quick start video and the software has become one of the most important tools in my tragically overwhelming work life (I own and operate a hotel management company.) Coupled with a basic understanding of tasks and project development and more importantly when to and when to not set deadlines, it really has been a tremendous solution for me. If you are going to come at this with calendar/to do list mentality then that is missing the point and difficulties will emerge and it might well mean that this is not the tool you need. I think the Omni chaps might do themselves a favour by getting someone like a Merlin Mann to write a precis of the concepts for use to post on their website. Anyway, my “twopenneth” worth for what it’s worth. Thanks Omni for a great tool. Whew, thanks for describing basically the exact same experience I’ve had testing out a bunch of GTD/task mgmt/to-do list tools for the PC, Blackberry, and now the Mac. So many of these products have good intentions but their unweildiness gets in the way of the most important use case of all (IMHO): the quick unfettered brain dump. Seeing through someone else’s eyes that OmniFocus has clear signs of this same basic roadblock (for me) has saved me the trouble of trying it out myself. Instead I took note of the recommendations above and installed a beta trial of Things – and was FINALLY able to capture and process my pending stuff in a quick and intuitive way. It’s still missing a few features at this early stage, but is still the best capturing/organizing tool I’ve found so far.